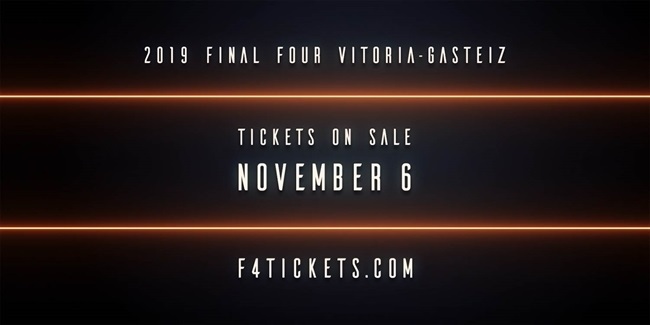 This means that the Fernando Buesa Arena in Vitoria-Gasteiz, Spain will be packed to the rafters during the event next May 17 and 19, 2019, to witness the crowning of a champ for the EuroLeague 2018-19 season. The Buesa Arena has a capacity of more than 15,000 seats, that will be packed with buyers from Spain, followed by Greece, Turkey, Israel and France to complete the top five countries that purchased tickets. Following the 24 hours pre-sale sold-out last week, today's high demand for the event made the general public tickets to be sold out in about four hours. An 80% of that seating total is for the public, including approximately 600 tickets per Final Four team held in reserve for fans of those teams once they are qualified. Turkish Airlines EuroLeague teams are already battling on The Road to #F4Glory, and soon fans can join the rush to be part of the next Final Four, too!